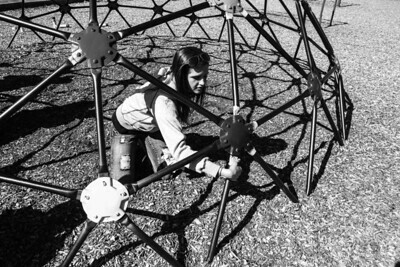 Sarah Nader- snader@shawmedia.com Woodstock High School senior Megan Hughes, 18, spray paints playground equipment at Dean Street Elementary School in Woodstock for senior service day Wednesday, April 23, 2014. Since1994, Woodstock High School seniors have given back to the community on senior service day. Each year they paint, rake, build and clean their way through residential and commercial areas, parks, and city properties. Sarah Nader- snader@shawmedia.com Lacey Heaver, 17 spray paints playground equipment at Dean Street Elementary School in Woodstock for senior service day Wednesday, April 23, 2014. Since1994, Woodstock High School seniors have given back to the community on senior service day. Each year they paint, rake, build and clean their way through residential and commercial areas, parks, and city properties. 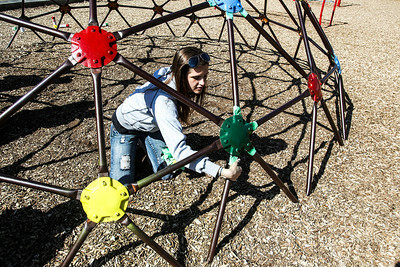 Sarah Nader- snader@shawmedia.com Woodstock High School seniors, Shannon Freeman (left), 18, and Lacey Heaver, 17 spray paint playground equipment at Dean Street Elementary School in Woodstock for senior service day Wednesday, April 23, 2014. Since1994, Woodstock High School seniors have given back to the community on senior service day. Each year they paint, rake, build and clean their way through residential and commercial areas, parks, and city properties. 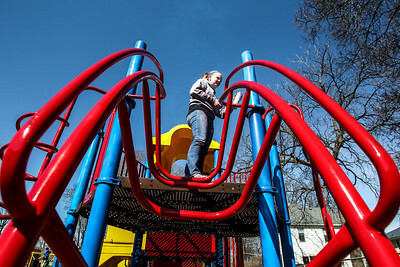 Woodstock High School senior Megan Hughes, 18, spray paints playground equipment at Dean Street Elementary School in Woodstock for senior service day Wednesday, April 23, 2014. Since1994, Woodstock High School seniors have given back to the community on senior service day. Each year they paint, rake, build and clean their way through residential and commercial areas, parks, and city properties.